Left to right: Daniel José Molina, Jeffrey King. Photo courtesy Jenny Graham and the Oregon Shakespeare Festival. Prince Hal, soon to inherit the throne of England, is busy living a hedonistic life with Falstaff and his band of merry rogues. But as Henry IV, Part 1 sets the stage for Shakespeare’s epic trilogy about the soon-to-be Henry V, the weight of the crown becomes increasingly heavy upon Prince Hal’s head. OSF’s 2017 production, continuing with Part 2 this season and Henry V in 2018, brings this classic tale of royalty into a modern setting. Bringing Shakespeare into the current day is fairly common, most famously (or infamously) represented by Baz Luhrmann’s film Romeo + Juliet. However, with a modern setting comes a difficult balancing act. If the direction is successful, the themes and meanings within the play become more evident. However, if the adaptation gets too cute, it could spell major problems for the production. Director Lileana Blain-Cruz, however, displays good judgment in her adaptation. Falstaff’s carousing makes more sense to us in a trendy club, and it doesn’t detract from the language or original plot. Daniel José Molina portrays the part of Prince Hal, which he inhabits with spectacular versatility. His drunken antics are frequently too much, even for his drinking buddy Falstaff (G. Valmont Thomas), but Hal respects his own limits, quietly avoiding actions that would actually hurt his reputation as an heir to the throne. Molina’s Hal becomes princelier when he’s thrust upon the battlefield – not, perhaps, nobler, but matured by the reality of war. Thomas’ Falstaff, conversely, hardly develops at all: He’s the big fun friend who’s useless in a crisis. His antics change from entertaining in the bar to pathetic on the battlefield. 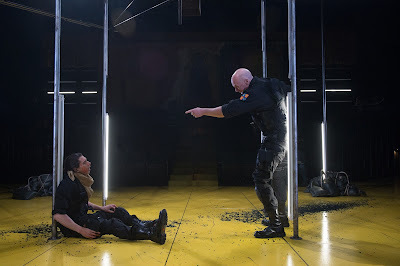 As Shakespeare wrote the play, King Henry IV (Jeffrey King) has a surprisingly small number of on-stage appearances. Yet it’s his interactions with Prince Hal and his ongoing struggle against Hotspur (Alejandra Escalante) and her aunt, rebel leader Worcester (Kimberly Scott), that drive the plot of the play forward. King’s portrayal is troubled and serious, splitting his attention between problems ranging from Hotspur’s military rebellion to Prince Hal’s adolescent one. His actions aren’t driven by emotion, but by a sense of self-preservation for his bloodline and his country. Hotspur and Worcester are as righteous as Henry IV is resigned; Escalante injects a powerful passion into both Hotspur’s battles and love life, and Scott’s Worcester possesses a cold, powerful indignation. The technical element of Henry IV, Part 1 keeps pace with the constantly changing tone of the play. The scene introducing Falstaff’s gang makes use of garish neon colors and pulsating music, while the climactic Battle of Shrewsbury is executed with a brutal military grittiness not seen on the Ashland stage since 2012’s incredible Troilus and Cressida. Accolades go to the technical team (scenic designer Adam Rigg, costume designer Dede M. Ayite, lighting designer Yi Zhao, and composer/sound designer Palmer Hefferan, among others) for their adept navigation of a difficult text: They know when to go over-the-top and when to let Shakespeare’s writing speak for itself. The ever-present back wall, featuring a torn mural of King Henry, writes volumes on its own. Henry IV, Part 1 at the Oregon Shakespeare Festival is a more balanced view of the weight of royalty than Macbeth or Richard III, which descend quickly into madness and betrayal; rather, it looks at the weight of character needed to be an effective ruler, and the vast gulf between “prince” and “king.” Despite being the first in a trilogy, OSF’s 2017 production of Henry IV, Part 1 possesses the deep meaning and character development required to stand on its own. Henry IV, Part 1 runs until October 28th.